Iyeza has come a long way from its humble beginnings in Khayelitsha. Here is the story of Iyeza as told by local and international media. Access to healthcare for communities in need. Sizwe Nzima competes in the Chivas Regal Venture competition. Discovery announces top entrepreneurs in its MedTech Silicon Valley Programme, Nov 2016. 30 under 30: Africa’s Best Young Entrepreneurs. 23/2/13 – article. Kaelo: Stories of Hope. Series 8, Episode 11 – video (7:44). Our WC Lead SA Hero for January. 4/2/14 – article and two podcasts (4:58 and 8:12, interviews with Bruce Whitfield and Kieno Kammies). Cape entrepreneur (21) makes Forbes list. 30/5/13 – article. Prescription for entrepreneurship. 26/10/12 – article. Last mile delivery making a difference. Inspiring stories from the Raymond Ackerman Academy. 2012 – video (2:13). Wheels of fortune continue to turn for young medicine men. 26/1/14 – article. Iyeza Express: In Three Minutes – A UCT Film & Media Production. Undated – video (3.10). 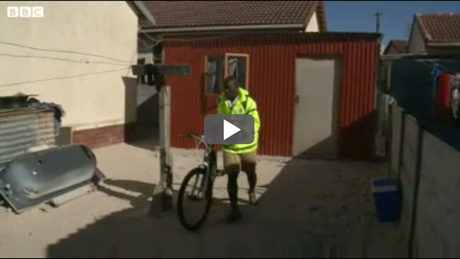 Medicine on wheels for Khayelitsha residents. 3/1/14 – article and BBC video (2:16). 200 YSA 2013: An eco-friendly entrepreneur. 6/13 – video (1:33).